Swab up the facts on applicator handles. Learn all you need to know about swab handles in the next 6 minutes! So… What Are the Different Types of Swab Shafts? Collect throat cultures and clean wound. Swabs have countless applications in the medical field. Used to collect DNA and perform microbiological tests. Along with hobbyists, china painting, or other detailed work. Ideal for cleaning guns, and to rid print heads on wide format printers of unwanted residue. Swabs and applicators are among the most versatile products used across a variety of industries. Yet, when swabs and applicators come to mind, most people only think of one type. In fact, there are dozens of different options available. For that very reason that there are many distinct purposes for these handy tools. In choosing the size of the applicator, as well as the tip material, you can also select the material for the shaft. Base this on the most appropriate fit for your unique needs. If you’ve ever had a lollipop, you can imagine what an applicator with a paper shaft might look and feel like. They’re typically white in color and are smooth to the touch. Choose your option for paper shaft applicators based on your application. Taking into consideration the length and tip type you’ll need. Paper is among the more basic materials available for swab shafts. With smaller tips, you can clean sensitive components in critical environments, as the materials are anti-static. Use paper shaft applicators with larger tips in some medical applications. Such as gathering specimens during exams, or collecting cells to perform laboratory research. In general, paper shaft swabs are also ideal for cleaning hard-to-reach places throughout offices and other workplace environments. Like paper, is also considered to be a “no-frills” option for a shaft material. Most wood is sourced from birch trees, making them a sturdy and inflexible choice for industrial environments. Some medical offices also choose wood shaft applicators for cleaning minor abrasions and similar practices. Because it doesn’t take much force to fracture wood, this particular type of applicator is not recommended if there’s a risk of breakage. Since these shafts are of natural materials, there’s a risk that they can introduce dust or contaminates into the environment. 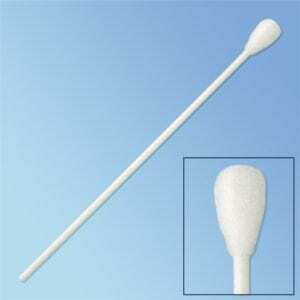 Thus, wood shaft swabs are not intended for use in cleanroom environments. That being said, wood swab shafts are an excellent, budget-friendly choice for basic applications. 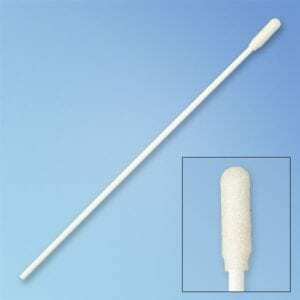 There are sterile wood swabs that can be used in many medical applications. 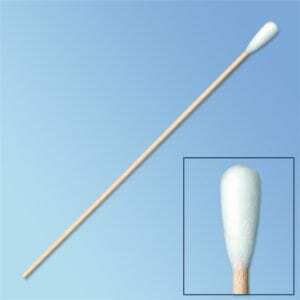 There are some types of wood shaft swabs that do boast low particulates for cleaning sensitive components. Like the other types of shafts listed here, they are available in varying lengths and quantities. And they can also arrive pre-packaged to prevent the risk of contamination. Plastic shafts are a step above wood and paper for many reasons. First, they have non-porous properties and will also not produce dust or contaminates. Making them ideal for sensitive environments. Additionally, they are more flexible than wood, and you can even break them cleanly if needed. Because they are synthetic, plastic shaft applicators are ideal for collecting microbiological specimens. They are also used in hospitals, clinics, and doctor’s office for patient care purposes. Such as wound dressing and cleaning. They also are a go-to choice for collecting cells for DNA testing. The most common type of plastic used in applicator shafts is polystyrene. Though some users prefer a different type of plastic: polypropylene. While it is also a synthetic material, it’s quite different from polystyrene because it is much more resistant to breaking. In industrial settings, many companies choose to go with polypropylene due to its increased level of durability. Of course, users who want the peace of mind in knowing the applicator shaft won’t break can also use this option in other environments as well. Lastly, we have the type of applicator shaft that’s the most unique of all: metal wire. Wire shaft swabs are most commonly found in healthcare environments. The diameter of the shaft can be designed to be much smaller than that of wood, plastic, or paper. 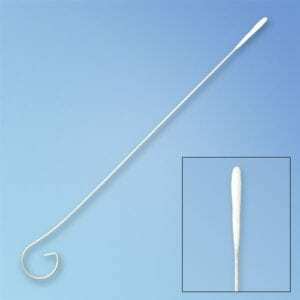 For situations in which a standard swab would be too large, the fine-diameter wire shaft swabs come in handy. Aluminum is commonly used in swab shafts due to its malleability. In medical situations where cells must be collected from sensitive areas like the ear, nose, throat, or other sensitive areas, the flexible, small shafts are useful for ensuring patient comfort. Additionally, these applicators fit well into transport tubes to make examination and lab testing seamless and hassle-free. Wire shafts are more flexible than other materials, so be sure to take that into consideration when choosing the right type for your needs. Additionally, they should not be used in any environments where conductivity might pose a risk. What Swab Handle Do You Need? With so many different options available, it can be challenging to know which type of applicator shaft is best for your needs. In what type of industry or environment will you be using the swabs? Will you be collecting cells from a person? If so, from a sensitive area? Are specimens sampled onsite or at a lab elsewhere? Do you need to worry about dust or contaminates? How durable do you need the applicators to be? Still overwhelmed with your choices? Start by visiting Harmony Business Supplies and searching for swabs based on your intended use. Choose among the following purposes: critical environments, fiber optic cleaning, forensics, gun cleaning, print head cleaning, sign machine cleaning, and crafts and hobbies. A broad range of sterile swabs intended for healthcare environments is also available. For convenience, many types of swabs can also be purchased in varying quantities. No matter your unique needs, there’s a swab out there for you! Visit us at Harmonycr.com to find the right swab for the job. Or give one of our supply specialist a call and we’ll help you find the right swab for your needs.